As his term winds down, Bank of Japan Governor Haruhiko Kuroda has retreated from both the radical policies and rhetoric of his early tenure, suggesting there will be no further monetary easing except in response to a big external shock. In a clear departure from his initial "shock and awe" tactics to jolt the nation from its deflationary mindset, he has even taken to flagging what little change lies ahead, trying predictability where surprise has failed. This new approach will be on show next week, when the BOJ is set to keep policy unchanged despite an expected downgrade in forecasts that could show Kuroda won't hit his perpetually postponed 2 percent inflation target before his five-year term ends in April 2018. "The days of trying to radically heighten inflation expectations with shock action are over," said a source familiar with the BOJ's thinking. "No more regime change." Kuroda told parliament last week that while the BOJ might again stretch the timing for its inflation target, he saw no need to ease at the Oct. 31-Nov. 1 policy meeting. "There may be some modification to our forecast that inflation will hit our 2 percent target during fiscal 2017," he said, the first time he has offered hints on upcoming projections. Japan's core consumer prices fell for a seventh straight month in September as household spending slumped, data showed on Friday, reinforcing the view it will take some time for inflation to accelerate to its target. In the past, the market has learned to expect the unexpected. In 2013, when the BOJ deployed its massive asset-buying program, dubbed "quantitative and qualitative easing" (QQE), his shock therapy boosted stocks and weakened the yen. Further surprises came with an expansion of QQE in October 2014, and then the switch to negative rates early in 2016, which he had denied was an option just days before. But the law of diminishing returns bought him less bang for each buck. "When monetary policy options begin to wear out, the shock approach doesn't work any more," said Toshiro Mutoh, former BOJ deputy governor and now chairman of Daiwa Institute of Research. "That's why the BOJ needs to avoid surprising markets and make its intentions more predictable through guidance." When inflation gave up the ghost again after initially showing signs of life, the BOJ was forced to revamp its policy framework last month to one better suited to a protracted battle against deflation. Since then, Kuroda has been jettisoning nearly everything that made his BOJ unique. He once derided his predecessor for blaming deflation on demographics and Japan's low growth potential, and in 2013 accepted sole responsibility for hitting 2 percent inflation. Now he says monetary policy alone cannot beat deflation and has called for government efforts to boost growth. Gone are the fixed timeframes he set for hitting that price goal, along with his reassurances that he would do "whatever it takes" to beat deflation. In a sign that the rising cost of his 80 trillion yen ($765 billion) a year bond buying could discourage further easing, the central bank said on Monday that some regional banks were struggling to earn profits as margins narrowed. "It would probably take something very damaging to the economy, like a huge yen spike, for the BOJ to ease again," said Masaaki Kanno, a former BOJ official who is now chief Japan economist at JPMorgan Securities. The BOJ's policy targeting the pace of money printing has been replaced by a complex "yield curve control" (YCC) with two targets - a short-term rate target of minus 0.1 percent and a 10-year bond yield target "around" zero percent. "It doesn't look like Kuroda's style at all," another source said. 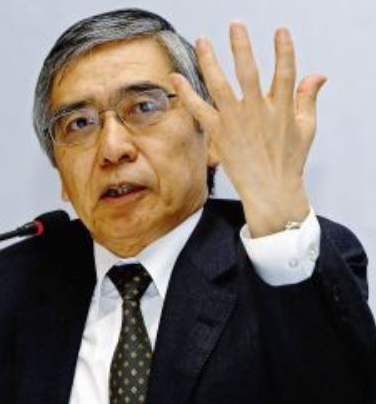 The new framework reflected the outcome of a comprehensive re-assessment of its policies the BOJ conducted last month, which included an unusually frank acknowledgement of what went wrong with Kuroda's monetary experiment. The BOJ admitted there was no direct link between the pace of money printing and inflation expectations in the short run. It also said its stimulus program wasn't powerful enough to weather headwinds and heighten inflation expectations. The make-over could also have driven a wedge between him and some BOJ members who had hitherto formed his majority on a divided board. Reflationist board member Yutaka Harada and Deputy Governor Kikuo Iwata have both sounded discordant notes in support of bond purchases despite the new framework, while Kuroda has said the pace of purchases could slow if the bank can hit its yield control target with less buying. All of which strips Kuroda of the assurance he once projected. "Yield curve control is an untested policy, so there's uncertainty on how it works," Mutoh of Daiwa Institute said. "It's an enormous new challenge for the BOJ."